The update for March 2016. I took a two week holiday to relax, and visited Dubai and Mauritius. I released a side project, a Sudoku game for iOS. Download it here and let me know your thoughts. Buying a level pack is most appreciated! It’s tricky to get autolayout working with UIScrollView on iOS. Here I note down for future reference how to get it working. I have also visited Dubai, UAE, this month. Although they don’t award Michelin stars, I visited two interesting restaurants worth mentioning. 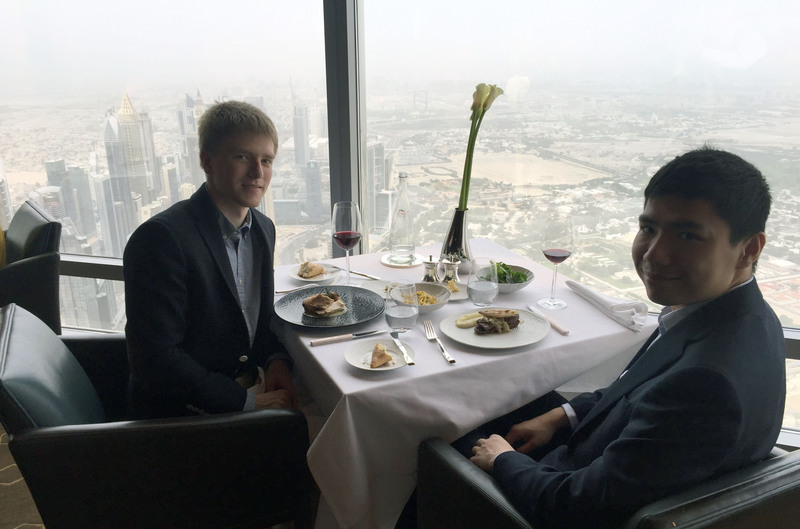 Highest restaurant in the world, located at 123 floor of the Burj Kalifa. Currently number 88 on San Pellegrino’s list of top restaurants in the world. I visited Dubai and Mauritius this month. It was my first time flying the A380, and it was a good experience. Even the economy offering on the A380-800 on Emirates for the JFK-DXB flight is very good. The seats are as comfy as you can imagine they will get in economy, the entertainment screens are even bigger than iPads, and the cabin crew is very polite. It was ok. This is a book about the growth of the Chinese spending class and how this will drive demand for many commodities, copper in particular as it is needed for all electrical devices. As the poorer are rising up to become the spending class they are buying quality-of-life improving things like air conditioners, cars, and other electrical appliances. Moreoever, copper mines across the world have decreasing percentage yields, are becoming much more expensive due to regulations, and soon might have to be built in less politically stable countries to meet demand - all things raising the price of the commodity. The book is written in a fictional story style, where a divorced doctor meets his electrician who serviced his home many years ago. The electrician now drives a Porsche - the doctor is intrigued and asks the electrician what he’s doing. We learn about his investment strategies that capitalize on the growth of the Chinese spending class. To learn more, the two of them travel to an investment conference and then to China to see it by themselves. The book could have been denser - there just wasn’t a lot of depth to what’s being covered and I feel the fictional storyline, while helping tell the story, was overtly slow and distracting from the facts, all of which could most likely fit onto an A4 piece of paper. I liked it, it was a good journey through what it was like working in the financial industries, mainly in Salomon Brothers in the mid 80s. Basically, obscene amounts of money + people that “if they weren’t salesmen would be truck drivers” = debauchery and frat-like behaviour. As some examples, the mortgage trading desk was apparently all fat - they would order $500 worth of mexican food for a couple of people, which as you can imagine is difficult, so included things like 5 gallon tubs of guacamole. The employees would play pranks on each other: for example, just before someone’s flight, they would sneakily take his suitcase, take out all the clothes and replace them with paper towels. On the information front I feel I learned a bunch from “Liar’s Poker”, mostly about mortgage backed securities and how they work. I haven’t really thought about my career that way - as a startup - and ‘The Startup of You’ was convincing that it’s a good way to think about it. At times it feels like a commercial for LinkedIn (update your LinkedIn profile, send messages, update status, share information, etc) but it wasn’t too distracting from the main message. Reid Hoffman is rich enough he doesn’t need any book proceeds so I think the information here is not biased and simply what worked for Reid in his career, with a little bit of LinkedIn advertisement thrown it. What particularly stuck with me is the importance of other people, your network. The media glorifies one-man success stories, but those are extremely rare or more likely even the one man has a network of people that he utilized to help him reach his goals. You can’t do it alone.